Lord Galeb is the monarch of the planet Vellar, ruling with the aid of his powerful consort. Still a novice hero, Booster Gold is manipulated by the alien known as Z to attack Lord Galeb. 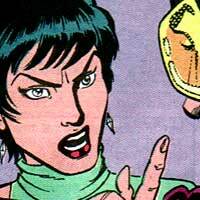 (Z, or Ranzee, had been brought to Booster Gold's attention only because Booster was the only hero that Z's human contact, Fern Redfern, could locate after failing to get the attention of SUPERMAN.) It takes Superman and Skeets I (see SKEETS) to convince Booster that Galeb is not the monster that Ranzee makes him out to be. Mac Garrison was the Vice-President of BOOSTER GOLD INTERNATIONAL. Booster Gold hired MacKenzie "Mac" Garrison to run his conglomerate, allowing DIRK DAVIS to focus on the job of being Booster's personal business manager and public relations expert. Geralyn Tierny is the media sensation GiGi in the 21st century. She will be so famous, that even in the 25th century her picture will still be recognizable to the general public. 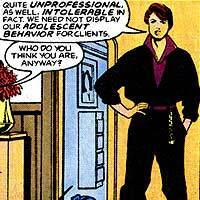 GiGi was a runaway and a pick-pocket when she made the mistake of trying to rip-off Booster Gold. Knowing that she was in for a rough future, Booster made a great effort to improve her life, changing her future and his own past in the process. 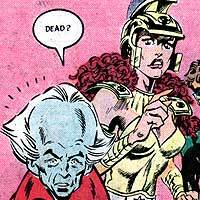 Gladys is a wealthy woman (worth approximately $100 million), about 60 years of age, who was temporarily married to Booster Gold (as reported by Booster Gold himself). She has never been seen, but from details provided by Booster Gold, she enjoys watching the television shows Golden Girls, multiple cosmetic surgeries, and sexual costume play. It is unknown whether Gladys took Booster Gold's name upon their marriage; legally in the 20th century, Booster's last name is "Gold," which would make his wife Gladys Gold. Booster Gold claimed to have married Gladys (maiden name unknown) during his temporary retirement from adventuring following the dissolution of the Justice League International. 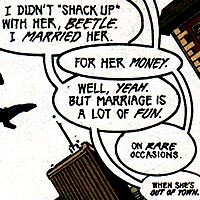 The marriage was short lived, and Booster now claims that he made the marriage up as a practical joke. The Guardians of the Universe are the race of beings that evolved on the planet Oa at the center of the Universe. 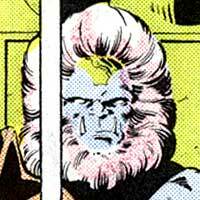 Ancient and benevolent, the male Oans have attempted to guide and protect the inhabitants of the Universe through such means as the creation of the MANHUNTERS and the GREEN LANTERN CORPS. Booster Gold met the male Guardian Herupa Hando Hu and his female Zamarian counterpart Nadia Safir when the two Oans traveled to Earth to initiate the next step of human evolution (see HEROES OF THE MILLENNIUM). Booster would later attend a party on the moon with Ganthet, the only mature member of the Guardians at the time, the rest having been newly resurrected by Kyle Rayner after their destruction at the hands of Parallax (see EXTANT).